This archive holds all posts form April 1, 2014. In today’s installment of the trouble with white women series, I turn to the white women who pose as warriors, visit countries outside the U.S. as tourists, and position themselves as saviors. Here is just one examples of the kind of thing I’m talking about (and no, none of this is an April fool’s joke). Mindy Budgor is a white woman who at age 32, according to Glamour magazine, “loves shoes, rocks red nail polish…and recently became the world’s first female Maasai warrior.” Budgor’s story appears in a book Warrior Princess: My Quest to Become the First Female Massai Warrior (2013). Glamour magazine also featured her story “as told to” Genevieve Roth in September, 2013. The quotes below are from the Glamour magazine feature. “From the moment I arrived, I felt at home. On my first day at the clinic, Winston, a local chief who was fluent in English, gave an introduction to the Maasai culture. He spoke about his people—their history, their reputation for drinking blood and eating raw meat (true) and killing lions (sorta true), and the storied Maasai warriors. “Warriors are crucial to our society,” he said, full of pride. “They protect our community in times of war, like your military protects you. A warrior must be able to go face-to-face with a lion if it tries to kill our cows. A warrior is loved by the community.” I’d been searching for something to believe in, and these men had found it right in the ground where they were raised. I wanted some of what they had. Winston explained that his tribe was at a crossroads because the Kenyan government was taking away more and more of its land and because global warming meant continual droughts that caused their cattle (their main asset) to die. 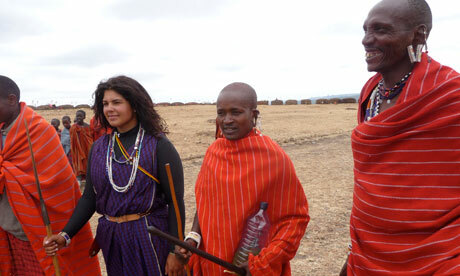 There was widespread fear among the tribe that the Masai culture will no longer exist in 50 years. Losing the integrity of a tribe because of westernisation seemed unacceptable to me, but I felt one element of modern life – women’s rights – could help the tribe continue while remaining true to its practices and beliefs. In choosing to take on a “mission” in Kenya, Budgor positions herself in a long line of white women who have envisioned Africa as a dark continent in need of saving. Vron Ware’s Beyond the Pale: White Women, Racism and History is a good place to begin exploring this history if you’re not familiar with the connections between white women, colonialism and imperialism. It seems clear that Ms. Budgor is either unfamiliar, or unconcerned, with this history as she blithely replays it throughout her narrative. In this neoliberal turn, then, she is on a mission not simply to “save” the Massai but if this also helps her get into business school, so much the better. Here, Budgor acknowledges that “my goals were selfish.” The shift comes when she determines that she’s doing this for a “cause” rather than just her own goals. Throughout, Budgor configures herself as the heroine who is “given an opportunity” that she’s “not going to squander.” What seems to escape Budgor’s attention – well, is so very much – but in this particular passage, she seems to be clueless to the weight of what Faith says to her: that “generations” of Massai women have tried to become warriors, but have been barred from it. Why should Budgor get to do this and not Faith? “I didn’t even think to ask” is her reply and it seems to be Budgor’s gestalt throughout. The resolution, if you will, for Budgor is a sort of white feminist version of “all’s well that ends well.” After her intervention, “at least 20 girls” are set to become warriors “as a result of our training and advocacy.” The Massai, ignorant and backward until Budgor’s arrival have now been ushered into the vastly superior and more gender egalitarian Western world. It is only through this act of a white savior and “warrior” that the Massai are redeemed. Perhaps not surprisingly, given how insulting Budgor’s “mission” and her narrative about it are, there has been some significant backlash against her project, for example, here, here and here. Still, what’s missing in these worthy critiques is an analysis of Budgor specifically as a white woman. To fully understand Budgor and Gilbert and all the other globe-traveling white women out to save themselves by saving dark-skinned people on distant continents, one needs to understand two key themes from Vron Ware’s work: 1) white femininity is an historically constructed category, and 2) the importance of understanding white feminism as a political movement within racist societies. It’s these two insights that are central to the point I’ve been trying to make with this series. “White femininity,” in Ware’s terms, or “white women” as I’ve been saying, are an historically constructed category. That structural position brings with it a set of roles, expectations, cultural imperatives that shape the individual people in that position. To be clear, I’m not arguing that there’s something inherent or essential that is at the core wrong with white women. My argument is that it’s this structural position that gets white women, like Budgor, in trouble. Ware’s second insight – that white feminism emerged from within racist societies – is also key for understanding Budgor. Her brand of feminism, “to help” the Massai in this particular way, makes sense within her worldview because her brand of white feminism comes from the U.S., a society with a deeply rooted racist social structure. So, if you simply take white U.S. feminism – unexamined for racism – and plop it down in Kenya, it looks a lot like Budgor’s odyssey. And, of course, it makes sense that she got a profile in Glamour magazine to promote her book. It’s a seamless fit.